Nikita Mikhalkov, regarded by some as Russia's Steven Spielberg, has already won an Oscar Award for Best Foreign Film once: in 1994, for "Burnt by the Sun" (a tale of Stalin-era repression). This year, he is back with his latest film, "12," which made the shortlist of five contenders for the award. "12" is a remake of Sidney Lumet's 1957 "12 Angry Men," but with a Russian twist. The story is of a Chechen teenager accused of murdering his father, an officer in the Russian army. Before the trial has even started, most of the jury has already made up its mind against the boy. For over eight years, Mikhalkov has evaded the limelight, producing no movies since releasing his "Barber of Siberia" in 1998. When "12" opened it caused quite a stir, raking in over $2 million during its opening week. "I am overjoyed that the movie was included in the shortlist of five nominees. This is a very important event for me," Mikhalkov told RIA Novosti. "12" was also awarded a Golden Lion in Venice and a Golden Amvrosi at the Milan film festival. The other four nominees announced on Tuesday are Kazakhstan's "Mongol" by Sergei Bodrov, Austria's "The Counterfeiters" by Stefan Ruzowitzky, Israel's "Beaufort" by Joseph Cedar and Poland's "Katyn" by Andrzej Wajda. The winner in the Best Foreign Film category will be announced at the Oscars ceremony on February 24. However, according to the newspaper Vedemosti, regardless of which film is chosen, the event will be a victory for Russia. Never before have two Russian directors (Mikhalkov and Bodrov) simultaneously been competing for an Oscar. Even though "Mongol" is being promoted as a Kazakh film, its production was international. The Foreign Film category of the Oscars is probably the most interesting of them all. It seems that, in choosing the nominations, the jury often ignores the most realistic, pertinent and most famous international films. Russia, however, has still managed to have some influence on all five nominees: "Katyn" is about the clandestine shooting of Poland's elite officer corps by Stalin's secret police during World War II. Ruzowitzky's "The Counterfeiters," which takes place during the Holocaust, features an immigrant from Odessa in the leading role (one can hear Russian speech in the background throughout the movie). Finally, the tragic "Beaufort" tells the tales of several Russian émigrés. "12" is not only a brilliant film, it is a powerful reminder of the good that can come from engaging citizens directly in their own judicial institutions through the jury system. 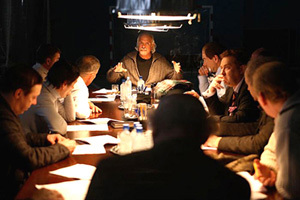 It is fitting that a great Russian director, Nikita Mikhalkov, should make a new, Russian version of the classic American drama "Twelve Angry Men," for "12" reminds us that the U.S. and Russia share great legal, as well as cinematic, traditions. Taken together, "Twelve Angry Men" and "12" remind us that trial by jury is one of the great traditions shared by the U.S. and Russia. Trial by jury has been one of the most basic rights of Americans since the founding of the United States in the late 18th Century. Russia's 1864 legal reforms mandated trial by jury and immediately Russia began to produce some of the world's greatest trial lawyers.